Heard of Power Rangers before but have never watched the show or really take a second look on those toys. Honestly this is not something that I am familiar... to cut the story short, Ethan's mom approached me for this theme, I gave that a try and I wish to thank her for her trust to leave the overall design (from colour to how many figurines etc) to me. All I was told is Power Rangers theme with 9"+6" two tier round cakes. This is the cake I created. 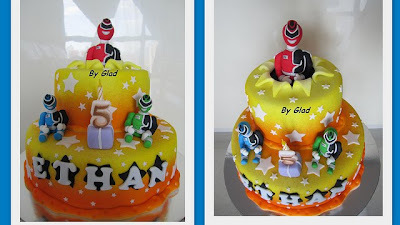 Am happy to hear Ethan can recognise that they are power rangers and he even said 'thank you' to me. Happy Birthday Ethan and enjoy your party! !